We’ve been lying low in the blogging sphere as life happens – work, a new baby, a toddler, and mommy hormones come into play. Still, we do start off our 2018 with a great discovery. 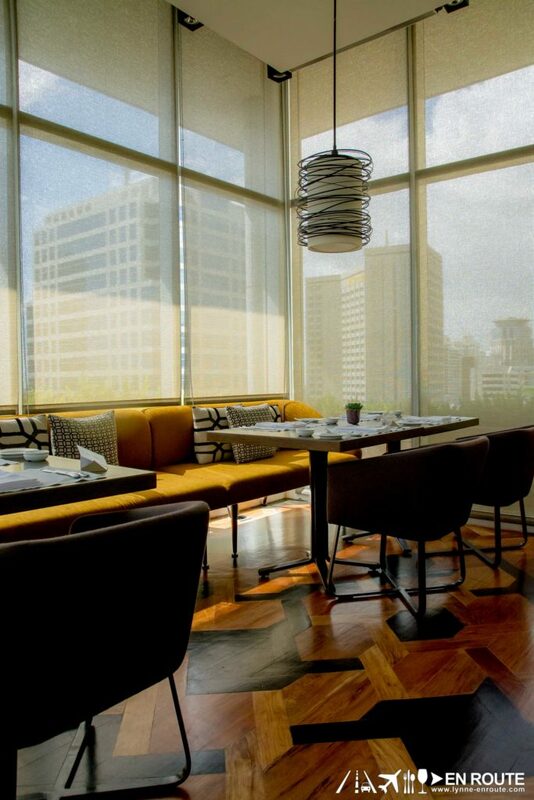 Aptly, at Discovery Primea. Introducing: Flame. Ever the gracious hosts, Director of Marketing, Marguaux Hontiveros and Chef Luis Chikiamco start us off with some drinks. Over lunch, mind you. 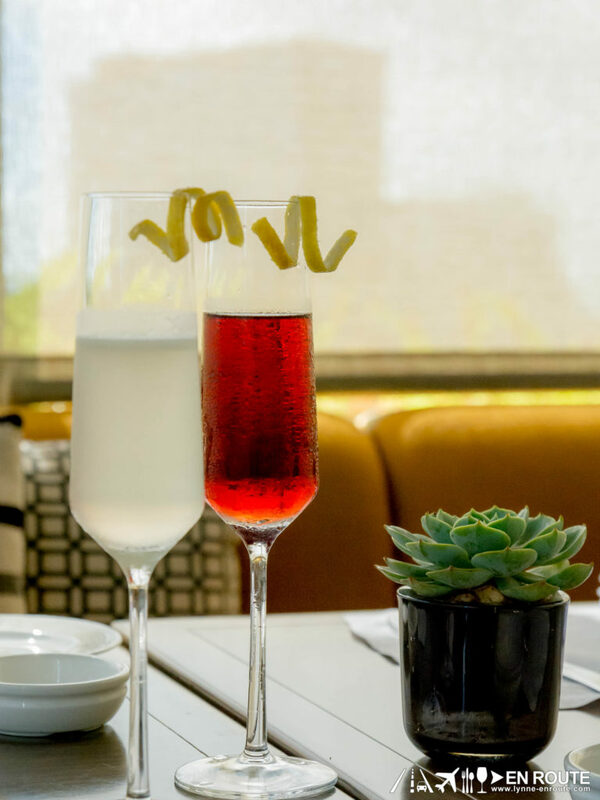 Sure, we’ll have a French 75, please. 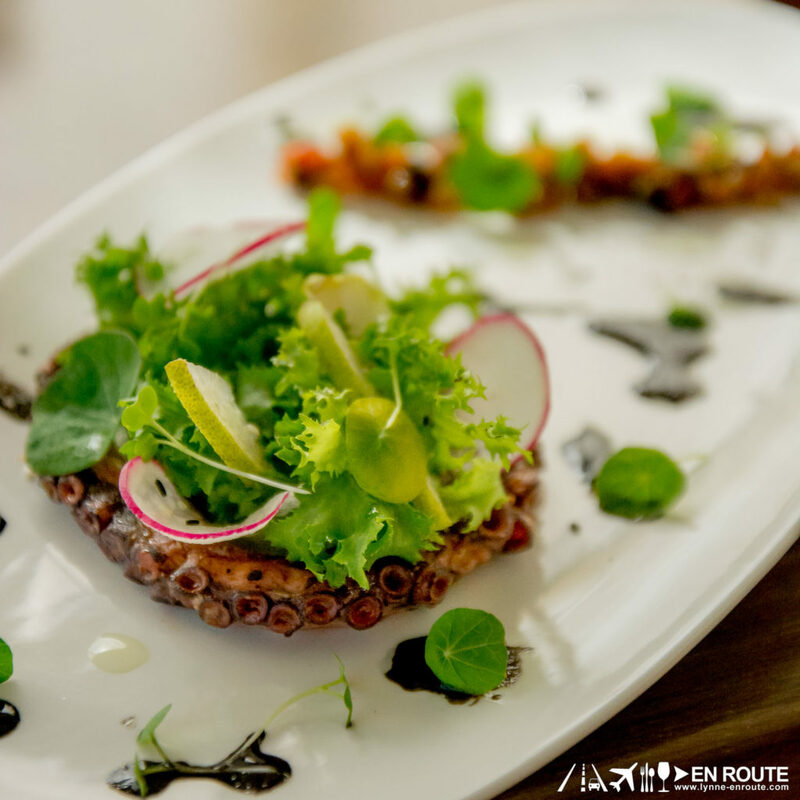 Chef Luis’ passion, creativity, and French training take centerstage as each dish is served. 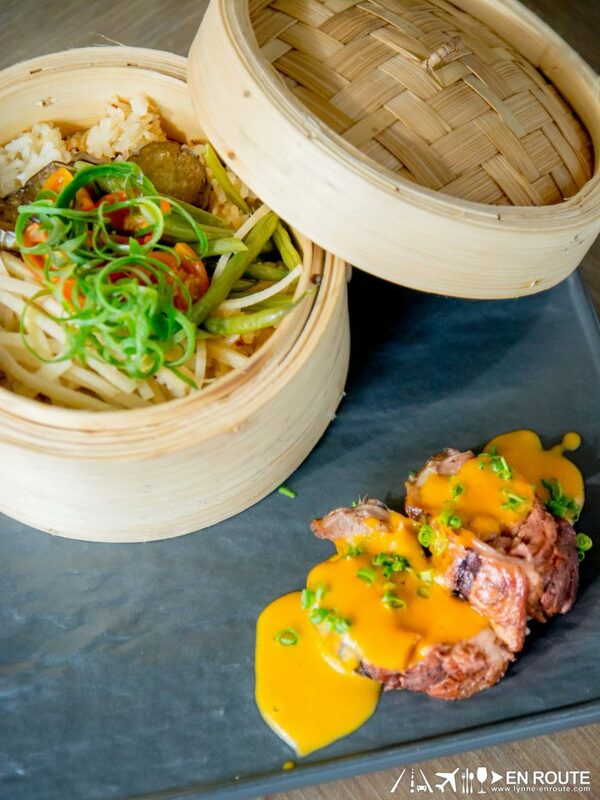 Flame’s Asian-inspired food is sophisticated but never over-complicated. 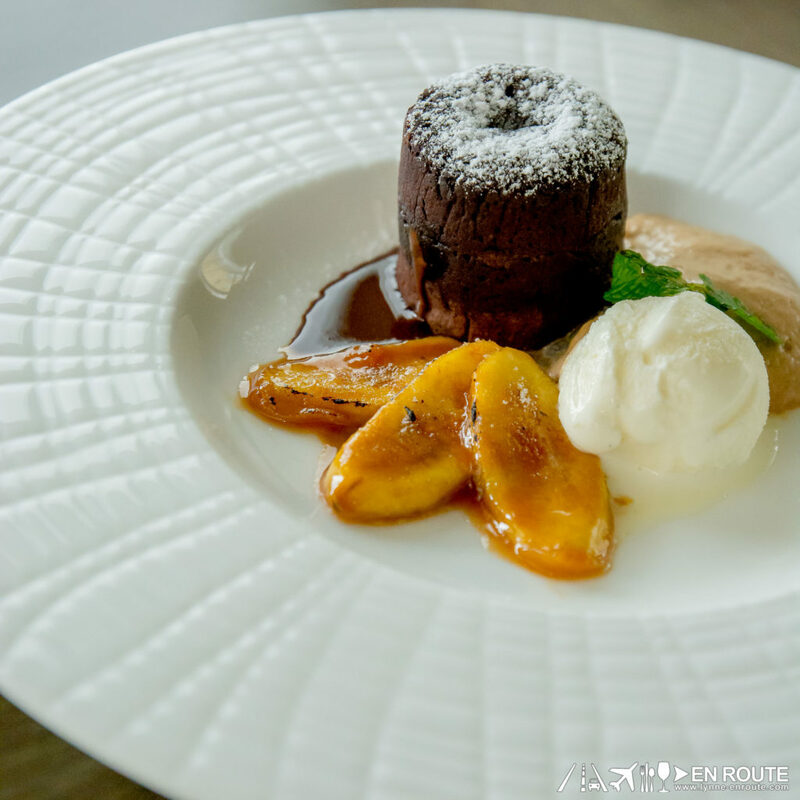 The dining experience is all about the joy of enjoying your meal with each bite, each sip, each nibble. Since we’re all about great beginnings, ladies and gentlemen, the Foie Gras Chawanmushi is the embodiment of all things good in this world. It’s so warm and hearty I ignored my scalded tongue after taking an excited mouthful. This is a dish that you want to stay curled up in bed with. 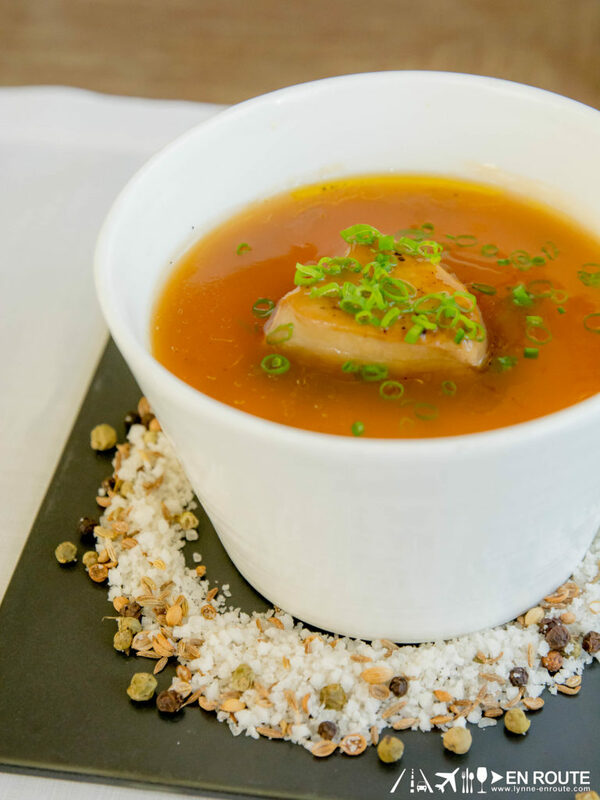 The dashi broth reduction is a balanced combination of dashi, soy sauce, water, and mirin. Then they served the doughnuts. Crispy Pork Belly Doughnuts served with a butterscotch miso sauce. It speaks of the genius behind the menu. 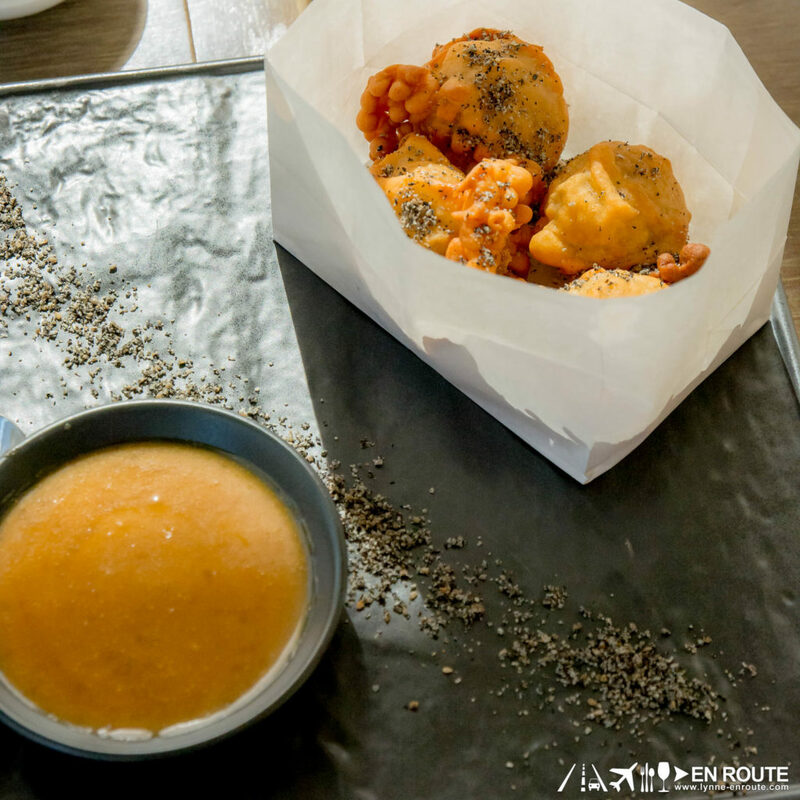 Pork confit is covered with a doughnut batter and then dusted with sesame powder once cooked. One is left to wonder if you can take out by the dozen. They do have lighter appetizers. 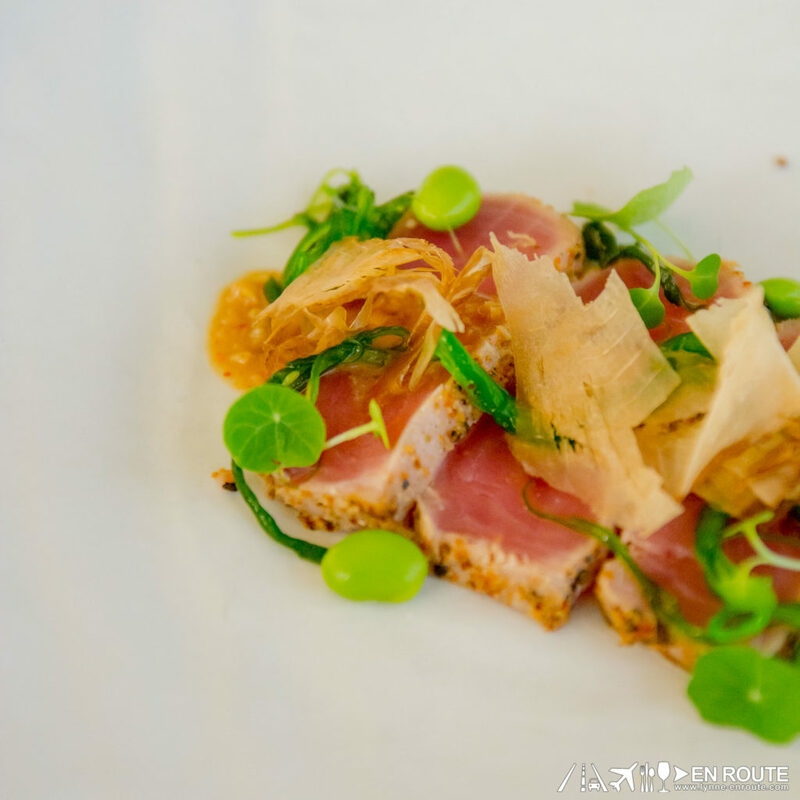 The January Power Lunch menu offers a choice between Chicken Consommé, Yellowfin Tuna Tataki, or Grilled Octopus Salad. 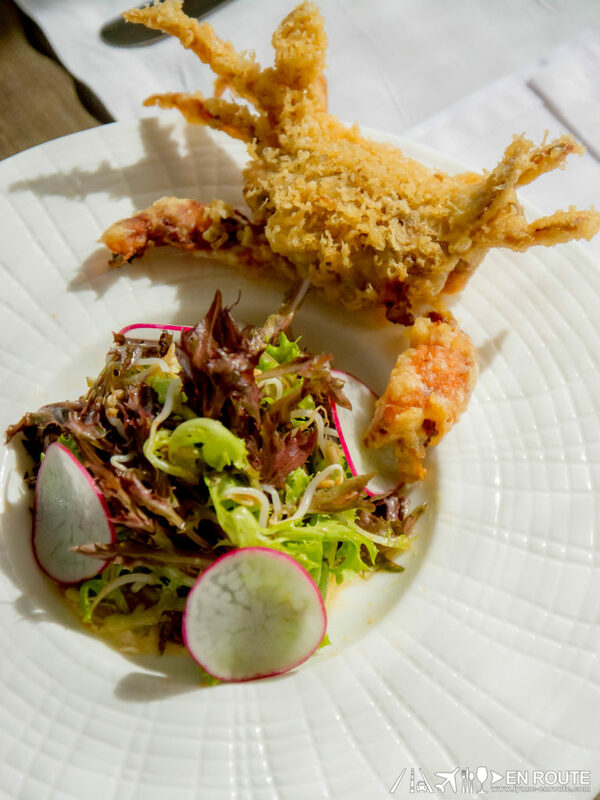 If you want to pick from the main menu, try the Soft Shell Crab Tempura. 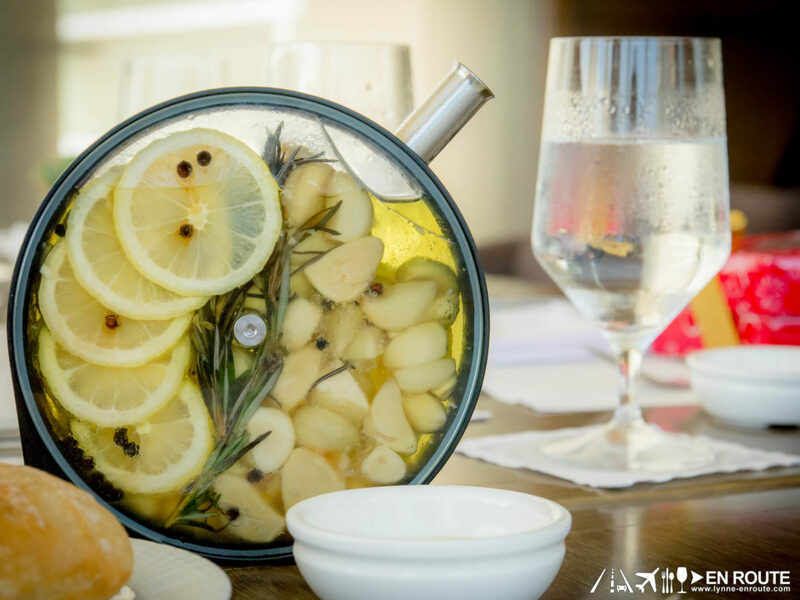 Freshness is guaranteed especially for the seafood. Speaking of seafood, at Flame, they love our sea-dwelling friends. 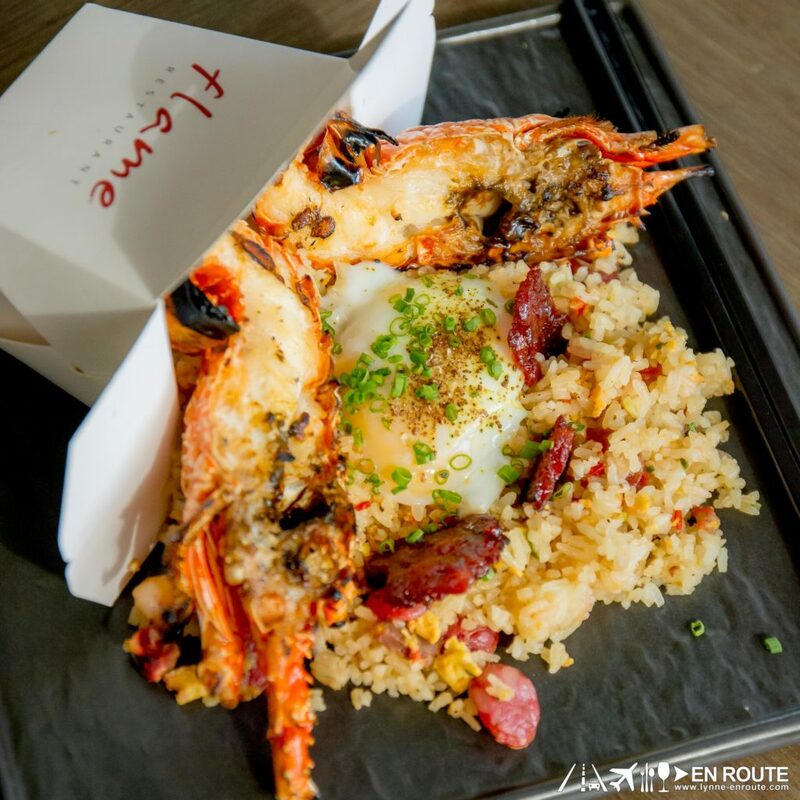 Two lobster dishes we had were the Chilli Lobster Spaghetti and the ‘“Take Out” Lobster Fried Rice’. One takes on the mild heat from a sriracha bisque while the other is a mix of pork, citrus, and creamy notes from egg and a lobster remoulade. If you’ve ever imagined how our very own kare-kare and adobo will come out with European cooking techniques, these are what you get: Braised Lamb with grilled eggplant, French beans, hearts of palm, peanut sauce, bagoong rice; and Adobo U.S. 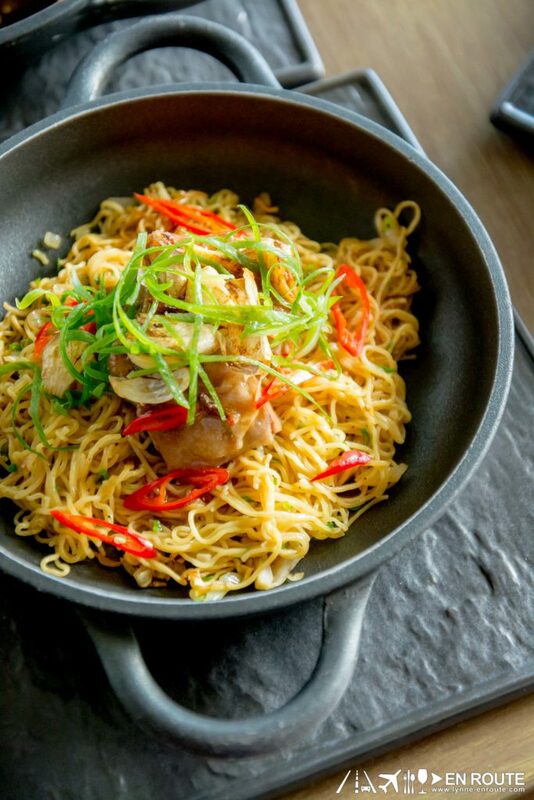 Beef Short Plate with egg noodles, crispy garlic, chilli, scallions. 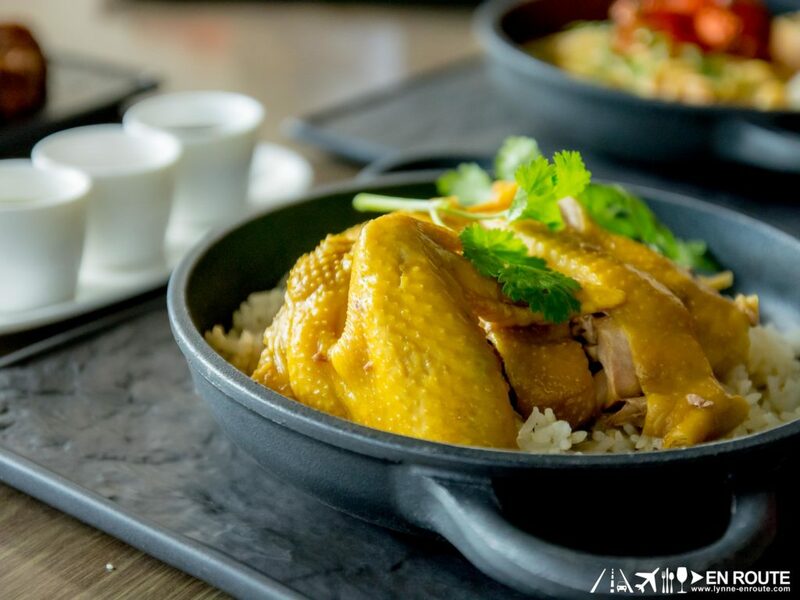 They also have a well-loved Asian favorite, Flame’s Hainanese Chicken. The dessert option from the lunch set is a Coconut Panna Cotta. 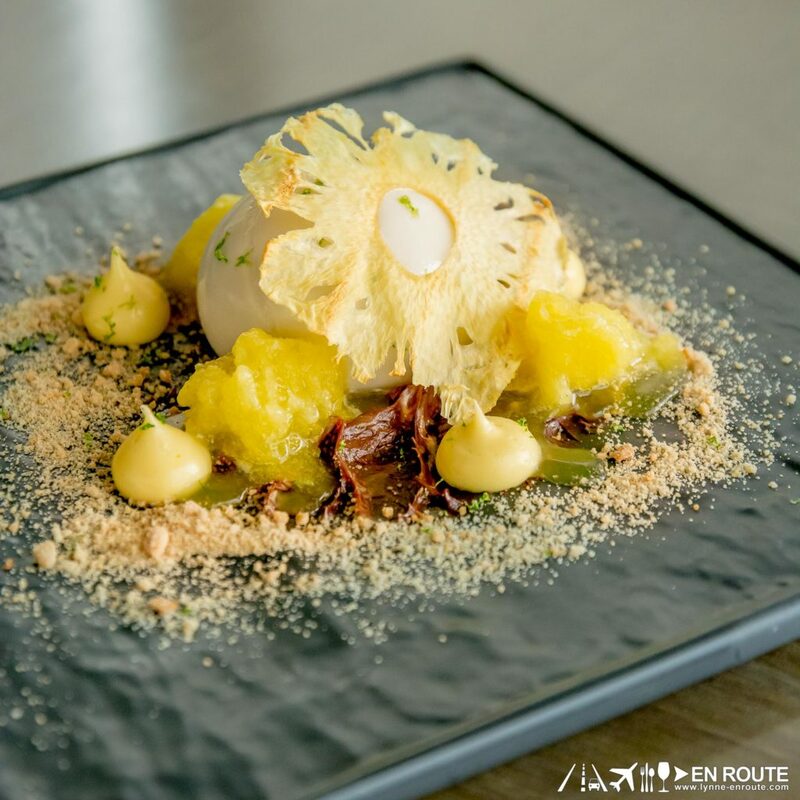 The coconut is not overpowering and is balanced well by the tart pineapple granita. They also have a separate dessert menu that gives you a choice among chocolate, cheese, and fruit. To appease the chocolate-lover in me, we tried the Hot Chocolate Soufflé. Imagine all this excitement over lunch as you try their Power lunch menu. Reinvented regularly, there’s always a reason to go back. 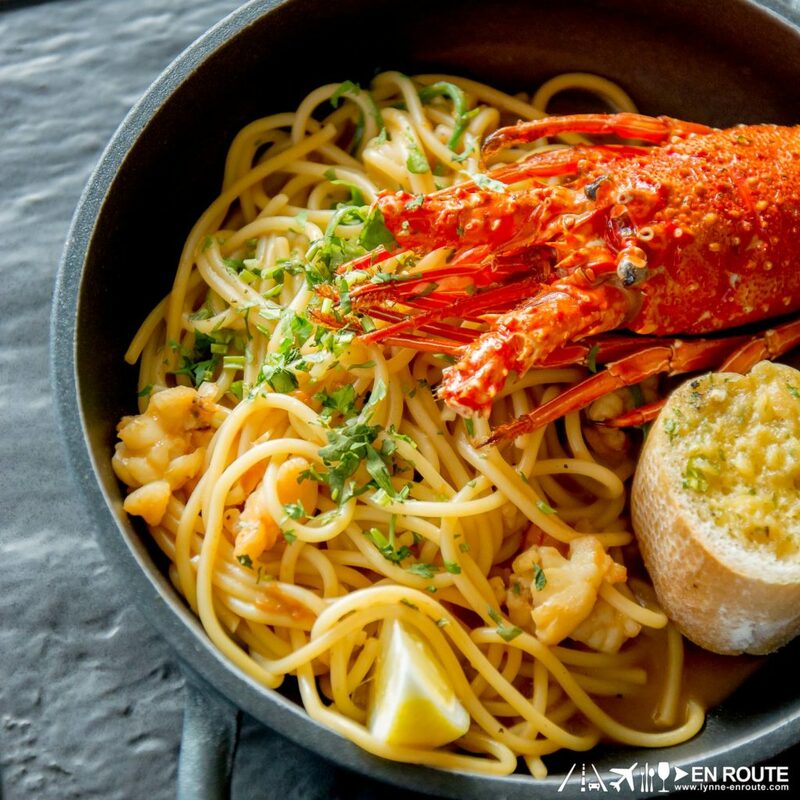 Inclusive of Lavazza coffee or TWG tea, 2 courses is worth Php880++ and 3 courses is worth Php980++. 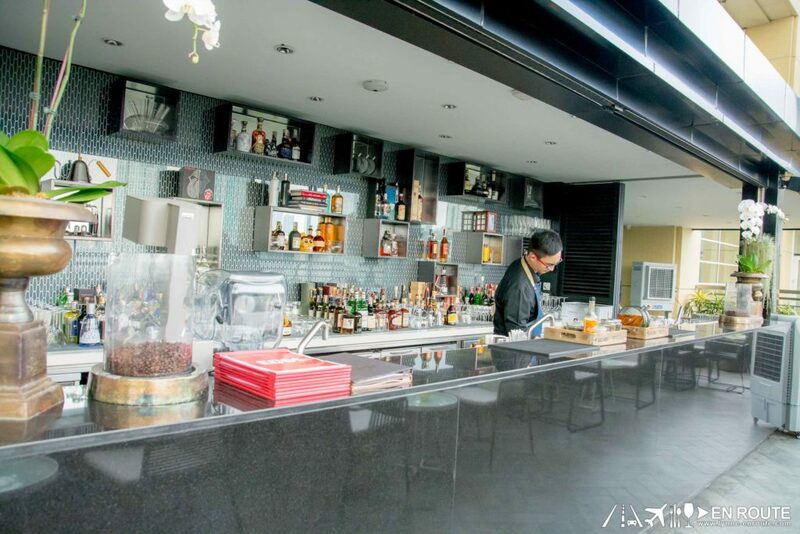 If you prefer to wrap up your meal with a drink, a few steps away is Edge, their open bar. They gave us a sneak peak and it is fully loaded! 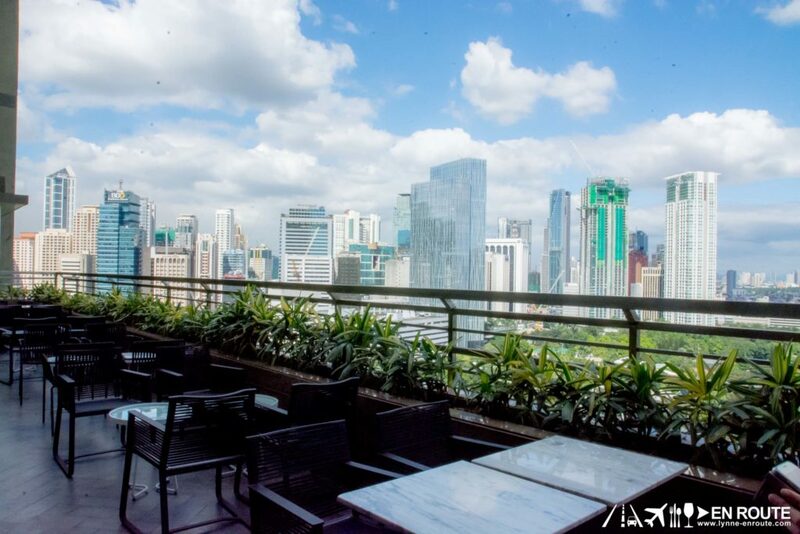 We can’t wait to wile the time away as we look over the Makati skyline. 6749 Ayala Avenue, Makati City. For inquiries and reservations, you may call +632 955-8888 local 71610. They are open Mondays to Saturdays, 11:30 AM – 2:30 PM and 6:00 PM – 10:00 PM.